Being a fly fishing guide doesn’t allow me to fish very often, so when I can i try to bring one of my daughter’s along. Recently I booked a few days up at Lopstick Lodge in Pittsburgh NH for a little father/daughter fishing time. We started out running a few dry dropper rigs thru the pocket water in the upper Connecticut river with good success that evening. The next morning the river was crowded so we rigged up some nymphing rods figuring with all the pressure we’d have better luck with getting down deep smaller nymphs in the pockets. We fished a very popular spot with some success, but I knew we were missing some fish in this run. So I switched over to a couple of mop flies on both rods and we picked up a good number of fish. The crowds there don’t stray far from parking lots as walking anywhere can tough with some dense woods and a lot of Bush whacking. So we decided to get away from the crowds, once we did the fishing went from pretty good to outstanding. 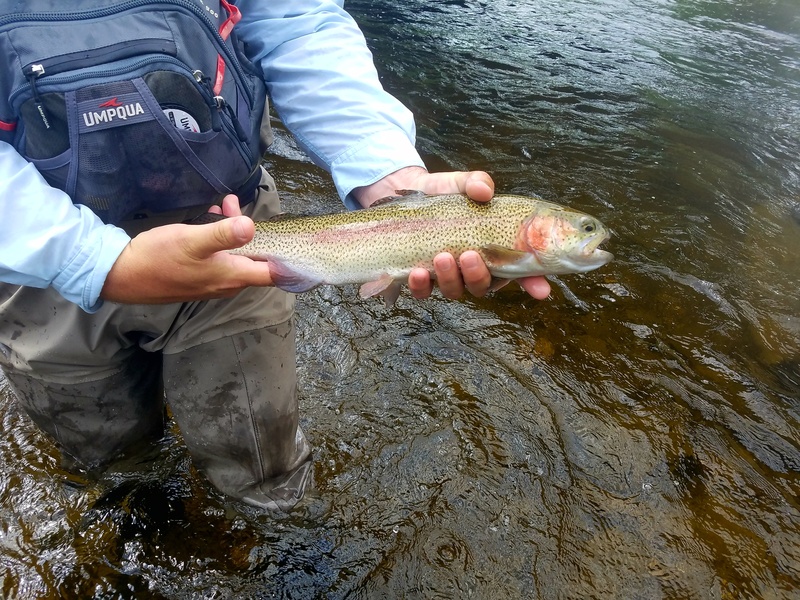 Big browns, rainbows, landlock salmon and brook trout all in the same pockets and small runs. Changing over to bigger flies seemed to draw the bigger fish out from under rocks and log jams. We finished up our short stay the next morning with not many people around mostly fishing nymphs again. It was a great time to test out some patterns I had tied before the trip some with good success others were so so, so we’ll save them for another time to test out.